The Botswana arts and crafts are a reflection of its people. The people of Botswana are largely known to be humble, peaceful, friendly and hospitable. These traits have a strong bearing on the quality of the crafts produced in the country. The Batswana celebrities are the epitome of these characteristics. Batswana are a mix-up of wide ranging ethnic groups. With each group bringing their own artistic nous the result has been the creation of different exquisite arts and crafts products. Botswana is a multi-cultural society. Bearing in mind the rate at which the Botswana culture is changing, thanks to its dynamism and adaptability, Botswana has made a conscious decision to preserve it. Some cultural groups, communities and institutions such as museums and archives take a lead in preserving the local culture. The arts and crafts that you see in Botswana strongly bear the marks of the local culture. The language of Botswana which is a part of Botswana culture is called Setswana. The language is spoken by over 90% of the population. 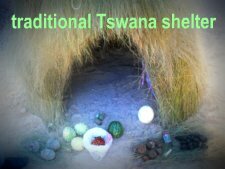 Presented with this scenario, there is a significant degree of similarities on the qualities of the crafts from Botswana. The craftsmanship displayed by Batswana make for the wide ranging arts and crafts products. The right skills are all there... basketry, weaving, lekgapo or indigenous art and pottery. 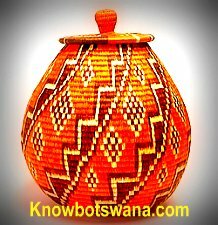 My favourite Botswana crafts include exquisite baskets, paintings, pots, ceramics, bowls and hand-woven tapestries. Botswana culture is best expressed in music and dance. Botswana music industry is a melting pot of all types of music genres. Dancing in Botswana is dominated by the local dance styles. Botswana has managed well the co-existence of traditional folklore and modern music. Folk music is popularly played by the likes of Ratsie Setlhako, Dikakapa, Speech Madimabe and Culture Spears. Other musical genres include Kwaito, Hip Hop, Rock, Kwasa Kwasa and Kwaito Kwasa. Botswana traditional dance stands heads and shoulders above most African traditional dance. Batswana learn to dance from early stages in their lives. Currently, the leading dance styles are borankana, chesa, ndozola and the popular San dance. Education in Botswana also has a part to play in the local culture. Botswana education system has been at the fore-front of Batswana's cultural, social, economic as well as creative significance. The modern arts and crafts products reflect modern global knowledge. Botswana's literacy level is above 83% as its people have been brought up through public and private education from primary to tertiary levels. The University of Botswana is one of the leading universities in Africa. Other acclaimed tertiary institutions include Botswana College of Agriculture, Botswana Accountancy College and the much awaited Botswana International University of Science and Technology. Botswana has its own set of home-grown celebrities. These are individuals who are known internationally. Botswana literature belongs somewhere in the strong African literary circles. The oral and written literature represents varied genres from extinguished local poets, orators and writers. Botswana literature has been brought into sharp focus, internationally, by the much acclaimed Alexander McCall through his stories turned into a TV series The No.1 Ladies' Detective Agency.